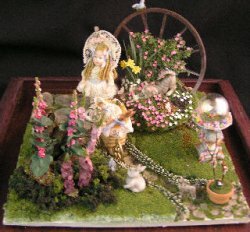 Vignette with garden scene. wagon wheel with flowers growing among and around the rocks. Also, has holly hocks, lots of flowers, rabbits, cats. Centered in the middle is a little girl with her baby buggy. 9 1/2" square.